Welcome to Marvel Strike Force Heroes page. This is the full description of MSF Wasp stats, skills and abilities. Wasp is a relentless blaster who works best with Ant-Man. Her first skill inflicts heavy damage and has a 30% chance to chain to another target. Her second skill strikes target for the medium amount of damage but always performs 1-2 bonus attacks and stun target if Wasp is charged (Wasp is charged if she dodged an attack). Wasp ultimate hit all targets in the enemy team for 270% of her base damage and this ability cannot be Countered. Passive ability grants her 20% dodge chance which is the highest dodge chance beside Spider-Man and Vision dodge chance. Wasp works best with Ant-Man because Ant-Man applies Evade to her at the start of every combat which means that she always can stun if they are on the same team. Wasp is a very expensive hero and her price is 100 shards obtainable only through Mega Orbs, Premium Orbs, and 4-9 Villains United Campaign mission. Attack primary target for 95% damage + 20% chance to Chain to 1 adjacent target for 70% damage. Counterattack breaks this Chain. Attack primary target for 90% damage + 50% chance to Bonus attack for 65% damage. If charged, then, in addition, Stun the target. Attack all for 90% damage, including Stealthed targets. This attack cannot be Countered. On Dodge, gain Charged. Gain + 5% Dodge chance. 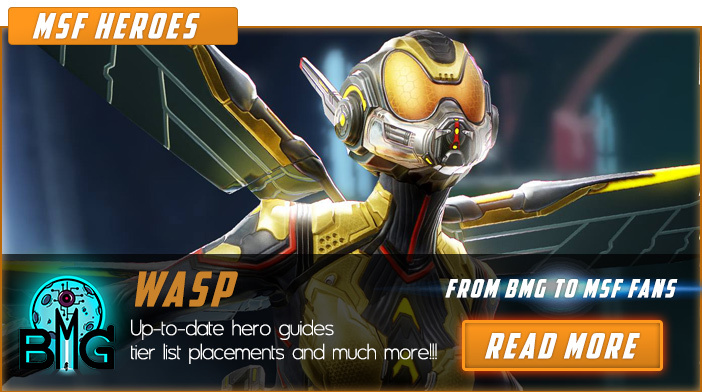 We hope that you enjoyed the description of MSF Hero Wasp. For detailed information about other MSF Characters check our MSF Heroes page.